How to soak and cook chickpeas including how to cook them on the stove, in a slow cooker, and using a pressure cooker. Plus I share how to properly store them as well as a few of my favortie ways to use them. Jump to our recipe for How to Cook Chickpeas or watch this quick video showing you how we do it. Have you ever wondered what to do with dried chickpeas (or other dried beans)? We used to as well until we learned how to cook them. Now we almost always have a bag of cooked beans in our fridge or freezer (yes, you can freeze them! See our tips below). 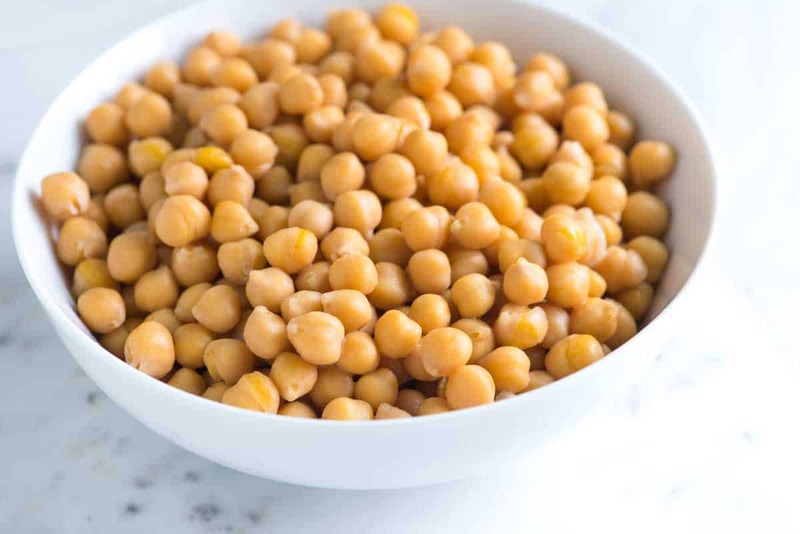 Canned chickpeas or garbanzo beans are readily available and we absolutely use them in our kitchen. That said, cooking your own batch of chickpeas is easy, they taste better and you get to control the texture. If you’re planning on making a dip or spread (like hummus) then having a batch of really soft cooked beans ready is perfect. If you’re adding them to a salad or stew, the option to keep the beans more firm is nice. And if all of that isn’t enough to convince you, it’s ridiculously cheap and you will always know what’s been added to the beans. You’ll be a chickpea star! There’s more than one way to deal with dried chickpeas. I’m going to show you how to cook chickpeas on the stove, in a slow cooker or crock pot, and in a pressure cooker (like an Instant Pot). Here are three methods we use in our kitchen. All three methods work really well and depending on your day you may find one makes more sense for you. After sharing the recipe, many of our readers asked about using a pressure cooker to cook chickpeas. I’ve added tips for pressure cooker chickpeas below. How Many Cups Of Cooked Chickpeas Will 1 Cup Of Dried Chickpeas Make? Dried chickpeas triple in size when cooked (if not a little bit more). So 1 cup of dried chickpeas will make about 3 cups of cooked chickpeas. Before cooking on a stovetop, you will need to soak the dried beans. 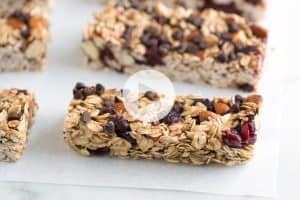 Look through the dried beans and pick out anything that doesn’t look like a bean — sometimes a rock or something else from the bulk aisle sneaks in. Now you can choose which soak method is best for you. As I mentioned above, we use both methods at home and it comes down to how much time or the time of day we’re looking at. For example, if you have a late start and need the beans tomorrow, use the long soak method and soak the beans overnight. When you get up in the morning, you’ll have plump beans ready to cook. If you need the beans cooked asap, the quick soak is best. For the long soak method, add the beans to a large bowl and cover with several inches of water. As the beans rehydrate, they triple in size — adding plenty of water is key. Soak the beans 8 hours or overnight. After soaking the beans, you can cook them (see how below). Whether you use the long soak or the quick soak to rehydrate your beans, you will still need to cook them. After the beans have been soaked, drain and rinse them well. To cook the soaked beans, add them to a large pot, cover the beans with several inches of water, and bring everything to a boil. Reduce the heat and simmer until they reach your desired tenderness, 1 and 1/2 to 2 hours. When simmering, you can keep the pot lid off or on, but slightly ajar (allowing some steam to escape while cooking). Beans simmered without a lid will be cooked, but firm (Perfect for salads or chili). Beans cooked with the lid on, but ajar, will be creamier, softer and break apart more easily. These are perfect for hummus or dishes where you want the beans to break apart. The beans can be cooked by themselves or with a few extras (like garlic or bay leaves) added in for flavor. The beans can be cooked by themselves or with a few extras added in for flavor. We love adding a bay leaf and a few garlic cloves. Adding a quarter of an onion, some carrot, or celery is also a great idea. We add a generous pinch of salt when there is about 30 minutes left. Only add salt towards the end of cooking since adding it in the beginning can cause the beans to become a little tough. Another option is to cook them in a slow cooker. The benefit of this is there is no soaking step — everything is added to the slow cooker you turn it on and walk away. Pretty easy. Add 1 pound of dried chickpeas and 7 cups of water to a slow cooker. Cook on high for 3 to 4 hours or on low for 6 to 8 hours. 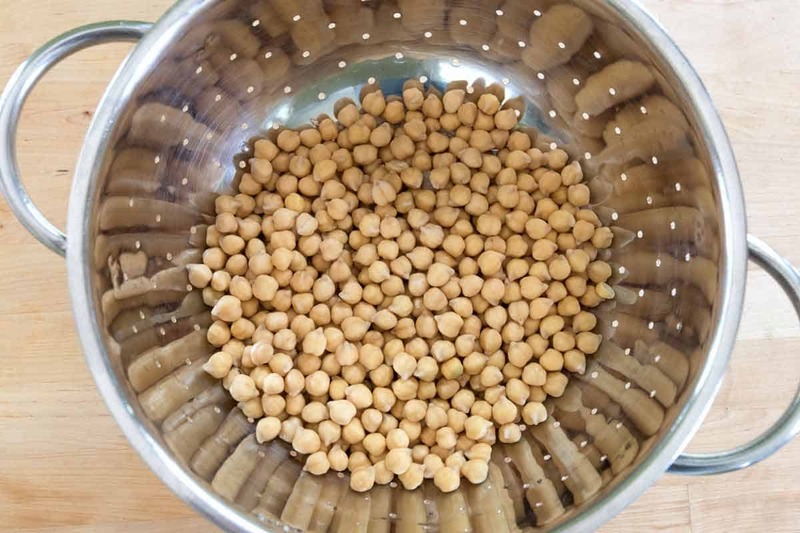 Soaked chickpeas: Add soaked chickpeas (from 1 pound dried) and 6 cups of water to the pressure cooker. Seal the lid and cook on High Pressure for 12 minutes, and then naturally release for 10 minutes. Vent the remaining pressure before opening the lid (you can tell when it is safe to open the cooker when the steam release valve drops). We recommend you read the user manual of your specific pressure cooker before using. Unsoaked chickpeas (my preferred method): Add 1 pound of dried chickpeas and 6 cups of water to the pressure cooker. Seal the lid and cook on High Pressure for 50 minutes, and then naturally release for 10 minutes. Vent the remaining pressure before opening the lid (you can tell when it is safe to open the cooker when the steam release valve drops). We recommend you read the user manual of your specific pressure cooker before using. When Are The Chickpeas Done? Keep in mind that depending on how you plan to use the beans you may want them to be firmer or softer. If you are cooking chickpeas for hummus, you’ll want the beans to be soft. On the other hand, if you plan to add the beans to a salad or stew, you may want them on the firmer side. 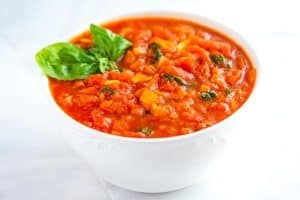 If your chickpeas are still hard after the cook time we suggest and you want them to be softer, continue to simmer them or cook in the slow cooker until soft. 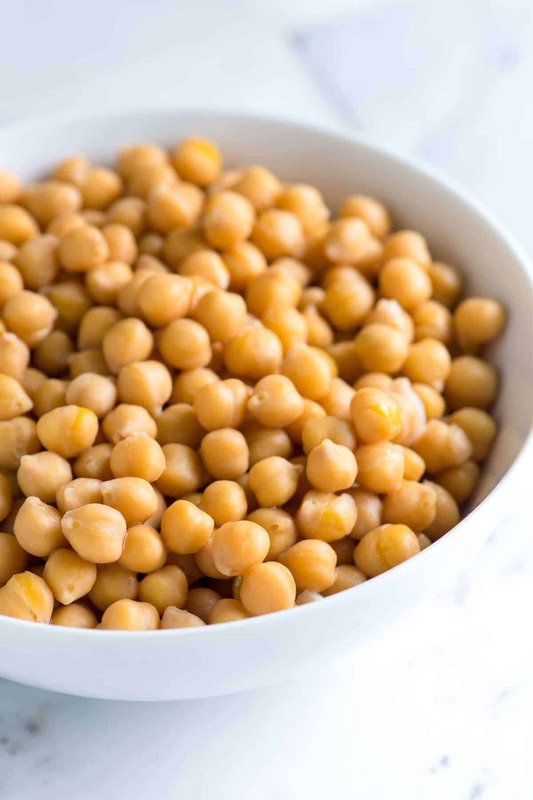 Refrigerate cooked chickpeas in an airtight container or food-safe bag without additional liquid. Cooked beans will keep 3 to 4 days in the refrigerator. To freeze cooked chickpeas, pat them dry then place in a single layer on a baking sheet lined with parchment paper or foil. Slide the baking sheet into the freezer and wait until the beans are mostly frozen, about 30 minutes. Throw the beans into a freezer bag and store up to 3 months. 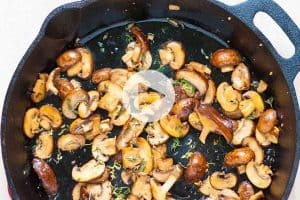 Now that you know how to cook them, here’s some ideas for using them! Roasted Red Pepper Hummus Recipe: How to make simple, creamy roasted red pepper hummus with sweet red bell peppers, canned chickpeas, garlic and tahini. Easy Chickpea Salad with Lemon and Dill: An easy chickpea recipe with lemon, fresh dill, crisp cucumber and tomatoes that’s quick to make and can be made in advance. Honey Roasted Chickpeas with Sea Salt: How to make crunchy roasted chickpeas with honey, cinnamon, and sea salt. We love how easy it is to make this honey roasted chickpea snack. They are so good that once you start eating them, it’s hard to stop. Honey Dijon Chicken Lettuce Wraps Recipe: We love these chicken lettuce wraps because they are easy, healthy, and so tasty. Hummus with Spiced Ground Beef, Feta and Mint: How to make hummus topped with spiced ground beef, feta cheese and mint. Use these cooked chickpeas to make our Utterly Delicious Chipotle Bean Chili Recipe! Toss them into a salad — here’s one of our favorites: Easy Kale and Bean Salad with Tahini Dressing and Walnuts. There are four simple methods for cooking chickpeas. The first two make use of the stove, the third uses a slow cooker, and the fourth method uses a pressure cooker. We use all methods in our kitchen and the one we choose will usually depend on timing. The long soak allows you to get most of the prep time done overnight. The quick soak allows you to start with dried beans and finish with cooked in about 3 hours and the slow cooker is completely hands-off. *If you use the slow cooker method, there is no need to soak the dried beans. Look through the dried beans and pick out anything that doesn’t look like a bean — sometimes a rock or something else from the bulk aisle sneaks in. If you are using the stovetop to cook the beans, you need to soak the dried beans. There are two options: Long Soak and Quick Soak. Long Soak Beans: Add dried beans to a large bowl and cover with several inches of water. As the beans rehydrate, they triple in size — adding plenty of water is key. Soak the beans 8 hours or overnight. Drain and rinse. Quick Soak Beans: Add the dried beans to a large pot, cover with several inches of water and bring to a boil. Boil for 5 minutes then take the pot off of the heat and let the beans sit in the water for 1 hour. Drain and rinse. If using the stovetop, add the soaked, drained and rinsed beans to a large pot. Cover with several inches of water and bring to a boil. Reduce the heat and simmer until they reach your desired tenderness, 1 1/2 to 2 hours (see notes). If using a slow cooker, add dried chickpeas and 7 cups of water to a slow cooker. Cook on high for 3 to 4 hours or on low for 6 to 8 hours. There is no need to soak the beans when using a slow cooker. 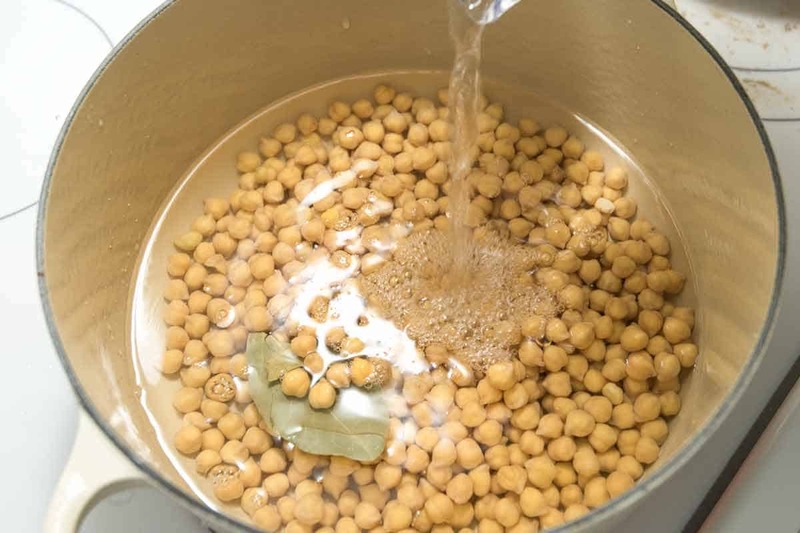 If using a pressure cooker, add 1 pound of dried chickpeas and 6 cups of water to the pressure cooker. Seal the lid and cook on High Pressure for 50 minutes, and then naturally release for 10 minutes. Vent the remaining pressure before opening the lid (you can tell when it is safe to open the cooker when the steam release valve drops). We recommend you read the user manual of your specific pressure cooker before using this method. Stovetop Method: When simmering, you can keep the pot lid off or on, but slightly ajar (allowing some steam to escape while cooking). Beans simmered without a lid will be cooked, but firm (perfect for salads or chili). Beans cooked with the lid on, but ajar, will be creamier, softer, and will break apart more easily. These are perfect for hummus or dishes where you want the beans to break apart. Adding Salt: You can add some salt, but only add salt towards the end of cooking since adding it in the beginning can cause the beans to become a little tough. We like adding a generous pinch of salt when there is about 30 minutes of cooking time left. Adding baking soda: Baking soda is often added when cooking dried beans. Some say it can reduce the gassy effects of fresh beans since it binds to sugars and helps to break them down, making the beans easier to digest. If you plan to add baking soda, add about 1 tablespoon to the soaking water for the stovetop methods. If using a slow cooker, add 1/4 teaspoon along with the beans and water before turning the slow cooker on. I soaked three chickpeas overnight, the next morning the top was full of foam. Did I do something wetting? Are the beans still ok to cook? Hi Laura, Don’t worry, the beans are fine. Some varieties create more foam than others. Before cooking the beans, use a spoon to remove the foam or rinse them. As they cook, if you see more foam come to the top, use a spoon to remove it. Does anyone have a recipe for dry roasting.. my italian dad used to cook them in beach sand on the stove top.. 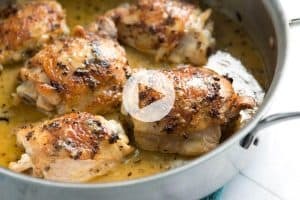 Does anyone know this recipe. thankyou,super good. direct to the point, as we need it! What about the 4th method — pressure cook them! Hi, beginning cook here, I had success making hummus with a can of chickpeas. That recipe called for some juice from the chickpeas and it seemed quite thick. If I start with dry chickpeas, how to I recover this juice? Hi Rick, If you start with dried chickpeas, you will need to cook them in water. You can use this water to think out your hummus. THANK YOU for having a “skip-to-the-recipe” link in the beginning of your articles!!!❤!!! I came upon the best trick making this today! I found a way to filter out all the skins without having to peel/pick off even one! it’s so laborious to do, and I just never would and then would be stuck with a disturbing amount of skins…. 2. to expedite the process of getting them in the freezer. when i started swishing the cold water around, i noticed that the skins started floating to the top! before letting them settle, i carefully drained just the water and yes! just the skins got filtered out! I did this several times until there was NO skins left!! Soaking the chick peas make the skin come off when you boil them . How do you prevent that? When skin comes off they split. Hi Shawna, I’ve noticed that the longer we cook chickpeas (so they are really soft), it’s likely the skins will start to come off by themselves. You could try cooking them a little less, which should help with the splitting problem. Even so, I’d expect that the skins will start to come away from the beans for some of the chickpeas in the batch. Thank you. I will try that way. We tried your carrot cake. Best recipe ever. Thank you. I love the quick soak method you described for chick peas. Have been making the chick peas that way, works very well for me. Can you use it with black beans too? Thanks so much! I want to make Humus so that I can control what goes in the Humus. My question is how to remove the skin? Will skin come off easy? THANKS!!!! Hi Margaret, The skins do come off quite easily. You can pull them one at a time — the skins slide away from the beans. Or add a bunch of cooked chickpeas to a clean dishtowel and rub them together. This should help get most of the skins away from the chickpeas. Curious…Why don’t you have to soak the beans when using a slow cooker? Would it hurt to soak them anyway? Hi Barbara, Since the beans are in the water for much longer, you really don’t need the soak. Do dried chickpeas have skin on them like canned? Yes, they are easy to remove once cooked. Hi Cam, there are a quite a few chickpea varieties. We usually spend 1 1/2 hours in our kitchen. If yours are done quicker, great! Are chicpeas good over rice like others? We have never tried it but it sounds delicious! If you want to do baked/roasted chickpeas, you still need to boil first, right? Recipe I have uses canned chickpeas dried out. Hi Chris, the chickpeas should be either canned or home cooked. Here’s a link to our post sharing how to cook chickpeas. Good receipes. I use pressure cooker as it speeds the whole cooking process. Same time of soaking is necessary though, overnight. I keep it for 15-20 minutes once the pressure starts to release to get little over cooked. My garbanzos seem to well cooked in 45 minutes. If I cook them longer, will my hummus be creamier? Hi David, If the chickpeas were cooked then they will work in the hummus. If you cook a little longer for softer chickpeas, it might make the hummus silkier. How much dry chic peas do you cook to get 2 cups cooked peas? Dried chickpeas will triple in size when cooked (if not a little bit more). So 1 cup of dried chickpeas will make about 3 cups of cooked chickpeas. How long will cooked chickpeas stay good in the fridge? When stored in an airtight container, the beans will last about 3 to 4 days in the fridge. Can this method be used with any kind of dry beans? Hi Mary, Yes, most beans can be cooked the ways shared in our article above. Hi! I have a couple questions. Can u pls tell me what is the proportion of bay leaves, garlic and onion when adding to the chickpeas while they are being cooked and do u blend them with beans or remove before blending. Hi there, we usually add 1 or 2 bay leaves, a few garlic cloves, and quarter of an onion. We usually remove the bay leaves, garlic and onion before making hummus or other dishes with the cooked beans. (Although, saving a garlic clove for the hummus could be nice). Hi. I tried your hummus recipe w/canned peas. It is excellent. Thanks for the recipe. It is the fourth hummus recipe I’ve tried & you’re so right that the order in which you add ingredients to the food processor (& the length of time you proceeds ingredients) makes a huge difference in flavor. I want to try w/dried peas. In the boiling/simmering process is the pot covered? Hi Jill, You can do either. If you simmer the beans with the lid left off, the beans will end up slightly firmer and more intact. If you add the lid, but leave it ajar (letting some steam release from the pot), the beans will become softer and will break apart much easier. For hummus, I’d simmer with the lid ajar. For chili or bean salads, I’d simmer with the lid off since I would prefer the beans a bit more firm in those cases. What about the usage of a pressure cooker to speed up this process, should the chickpeas still have to be soaked prior in this case? Thank you. Hi Gary, We have never cooked chickpeas in a pressure cooker. You may have better luck reading here. Thanks for recipes, looking forward to making these! Do you know what quantity of dried chickpeas yields 1 cup of cooked? I don’t want to cook more than I need. 1 cup of dried chickpeas equals approximately 3 cups cooked. If you do end up making more than needed, you can freeze the cooked chickpeas for next time. Pat the cooked chickpeas dry then place into a food-safe freezer bag. Spread them out int one layer then freeze flat. don’t you mean 4 hours on high or 8 hours on low? Hi Tracey, Yes! Whoops. Thanks so much for letting us know. The post has been updated. You forgot to update this info in the top portion that lists the methods.